Checked luggage takes a beating when it’s being loaded onto an aircraft -- and the picnic basket strapped to the back of your bike isn’t immune from a bumpy ride, either. Whether you’re in the air, on the road, or on the bike trail, traveling with liquids and fragile items is a lot less worrisome when you’ve got VinniBag, a travel bag with inflatable air chambers to cushion bottles of wine, olive oil, toiletries and more. 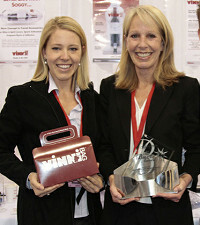 Elizabeth and Summer Scarbrough created VinniBag to keep fragile items intact and prevent the mess of broken or leaking items inside luggage. The mother-daughter team designed the U.S.-made travel pouch to withstand fluctuations in altitude and temperature, so it’s safe for airplanes. If you’re packing multiple small items, VinniBag’s chambers can isolate and immobilize each piece. You can adjust the amount of inflation, depending on what you’re carrying and the space available in luggage, backpacks, tote bags or the car trunk. 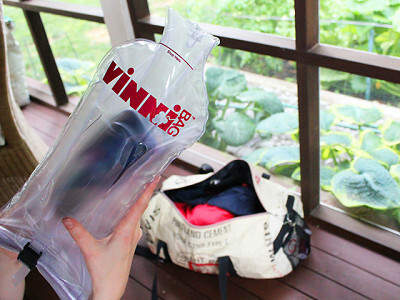 When you’re not using it, you can deflate VinniBag and fold it flat for easy storage. There’s nothing worse than reaching your destination only to find that a broken precious bottle of wine, perfume, or homemade jam has made a wreck of your baggage. For yourself or a favorite frequent flier, VinniBag makes a very reassuring travel companion. Greetings from Elizabeth and Summer! We're very excited to be featured on The Daily Grommet, and pleased to introduce you to our VinniBag. As avid travelers, we wanted to create a way to safely transport prized possessions like wine, spirits, olive oil, keepsakes and other fragile items. We’re committed to supporting our economy and our environment, which is why VinniBag is 100% USA made and has a recycle program. We live by the motto, “Work hard, have fun, and be nice,” and are delighted answer any questions you might have. I don't think you can bring anything in glass jars or bottles on a plane - I know they made me throw out some Sanders Hot Fudge when I tried to bring it on a plane - in my bag. @ Jocelyn : I believe this Vinnibag is for packing glass/liquids etc. in checked luggage. the 3 oz limit still applies to items in your carry-on bag. If you ever intend marketing the VinniBag in Australia, you may have to rethink the name. 'Vinnies' in Australia refers to the 'goodwill' type shops run by the Society of St Vincent de Paul, a Catholic charity. The shops are commonly known as Vinnies. We say we have put our donations of clothing etc into a 'Vinnies' bag - an entirely different concept from your great invention. I go to thrift stores, estate sales, etc. and the items I buy may be broken when I arrive home. They are never wrapped well enough or if I have to put my brakes on things slide across the car and break. I hope these bags would enclose smaller items or odd shapes so they wouldn't get broken. It would be great to have different size bags if necessary. Checked luggage takes a beating when it’s being loaded onto an aircraft -- and the picnic basket strapped to the back of your bike isn’t immune from a bumpy ride, either. Whether you’re in the air, on the road, or on the bike trail, traveling with liquids and fragile items is a lot less worrisome when you’ve got VinniBag, a travel bag with inflatable air chambers to cushion bottles of wine, olive oil, toiletries and more. Elizabeth and Summer Scarbrough created VinniBag to keep fragile items intact and prevent the mess of broken or leaking items inside luggage. The mother-daughter team designed the U.S.-made travel pouch to withstand fluctuations in altitude and temperature, so it’s safe for airplanes. If you’re packing multiple small items, VinniBag’s chambers can isolate and immobilize each piece. You can adjust the amount of inflation, depending on what you’re carrying and the space available in luggage, backpacks, tote bags or the car trunk. 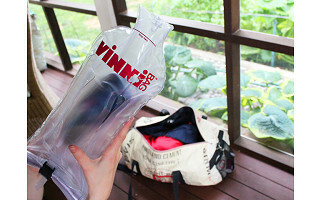 When you’re not using it, you can deflate VinniBag and fold it flat for easy storage.